Mafia Stories: Santo Trafficante Jr. 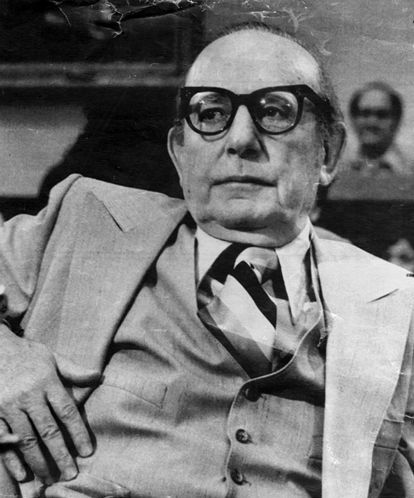 Despite numerous stunted ambitions, Santo Trafficante Jr. was regarded as one of the most powerful of the Mafia bosses in the United States. He ruled the Tampa, Florida, family with an iron hand and, following a long Mafia tradition in that city, has kept it profitably involved in many standard organized crime activities, such as gambling, loan-sharking and, above all, narcotics dealing. Florida is regarded as the top entry point for drugs into this country. Born in this country, he is one of the few sons of a Mafia don to succeed to the godfather position in a crime family. His father, Santo Trafficante Sr., was boss for many years until his death in 1954. The elder Trafficante bequeathed his crown to his son, and his offspring had the required cunning, forcefulness and determination to take it. Through the years it has been difficult for law enforcement officials and other observers to gauge Trafficante's activities, although it has been well known that he, as much as his father, initiated the crime family's move into the gambling casino world of pre-Castro Cuba. Trafficante took up Cuban residence in 1946 and remained there until Fidel Castro ejected the mobs in 1959. After that Trafficante returned to Tampa and maintained the family's international ties in other fields. It has been alleged that in 1969 he journeyed to Saigon to make arrangements with the Corsicans there to ship Indochinese heroin unto the United States. Trafficante was known to have been deeply involved in the CIA efforts to involve the underworld assassination attempts on Castro. Under pressure of a court order granting him immunity from prosecution, but threatening him with contempt if he refused to talk, Trafficante admitted to a congressional committee in 1975 that he had in the early 1960s recruited other mobsters, such as Johnny Roselli, to assassinate Castro. "It was like in World War II," he told the committee. "They tell you to go to the draft board and sign up. Well, I signed up." According to Trafficante, he and his fellow underworld conspirators considered "poison, planes, tanks. I'm telling you, they talk about everything." Eventually, he said, the plots all failed. Others give a different interpretation of the facts, that Trafficante above all others took the CIA for a ride. This version, backed by Roselli's statements, holds that Trafficante had no intention of trying to get Castro, that poisons prepared by CIA master chemists were simply flushed down Florida toilets, and moneys from the CIA to be siphoned to Cubans on the island never left the United States. Some lawmen, and Roselli and his superior, Chicago boss Sam Giancana, ended up believing that Trafficante had even sold out to Castro. When Castro took power, he jailed Trafficante for a time, then suddenly released him and allowed him to leave with all his money. The theory holds that Trafficante became Castro's agent in Florida, and when the CIA plots developed, he probably reported everything to Cuban agents in the state. There has long been a theory among many researchers that the assassination of John F. Kennedy was actually a Castro retaliation for the CIA-Mafia plots against him. In 1978 Trafficante testified once again before a House assassination committee on the Kennedy murder. This time the committee was especially interested in a sworn statement made to committee investigators by Cuban exile leader José Alemán that months before the Kennedy assassination, Trafficante had told him, "Kennedy's gonna get hit." However, in public testimony, Alemán, clearly fearful of Trafficante's wrath, gave the comment a different interpretation. What the mob boss probably meant, Alemán said, was that Kennedy would be hit by Republican votes in 1964—not bullets. It was the first and only time Trafficante was granted status with George Gallup as an expert on voter opinion, and for that matter it was virgin use of the term hit in mob lingo as being synonymous with "landslide." Trafficante glided through the probe. He was one of the most successful Mafia bosses in that respect— suspected of much but convicted of little until his death in 1987 of a heart ailment.